Westerlo Volunteer Fire Company Seeks New Members | Is there a FIRE in you? Westerlo Volunteer Fire Company held a “Wetdown” of the new Rosenbauer Pumper 39-25 August 19th at 11 am at the South Westerlo Town Park. Christening the new piece of apparatus that will be usee to help protect the town and aid surrounding fire districts. Berne Volunteer Fire Company and Rensselaerville Volunteer Fire Company participated in the ‘wetdown’. The Westerlo VFC annual picnic was held afterward. A wetdown is a ritual celebrated by many volunteer fire departments in the United States in which squads of firefighters from neighboring towns ritualistically commission a new fire apparatus by anointing it with water sprayed from the visitors’ firefighting equipment. A San Francisco cable car holds 60 people. This blog was viewed about 760 times in 2014. If it were a cable car, it would take about 13 trips to carry that many people. This entry was posted in Uncategorized on January 1, 2015 by westerlofiredepartment. We would like to honor these individuals with a proclamation from the Albany County Legislature for their heroic deeds. This is honoring our firefighters from the hilltowns for their assistance to others during the Buffalo 2014 snowstorm and the proclamation reads as such. WHEREAS, on November 18th 2014, Buffalo New York received five feet of snow within 24 hours, leaving drivers stranded on roadways and residents trapped in their homes. WHEREAS, the storm shut down the city of Buffalo and its surrounding suburbs for days, leaving these most in need alone and scared for their well-being. WHEREAS, on Wednesday, November 19th a group of five highly-trained Albany County volunteer fire fighters embarked on a journey to assist Buffalo residents in the recovery efforts and to help reach those in need. WHEREAS, these brave firefighters included Scott Duncan, Chief of the East Berne Fire Department, Jason Smith Assistant Chief of the East Berne Fire Department, Brandon Kallner, Firefighter of the East Berne Fire Department, Nicholas Minute, Captain of the Berne Fire Department and Ethan Sharpe Lieutenant of the Westerlo Fire Department. WHEREAS, these five men covered 148 miles while working 70 hours 60 of which were in the town of Hamburg New York, where they conducted four search and rescues, provided seven assists to EMS for transportation to hospitals, conducted five welfare checks and medication deliveries, and attended eight collapsed buildings. WHEREAS, selfless individuals who give their time and energies to help those in need, are an asset beyond remuneration and cannot be sufficiently extolled. NOW THEREFORE RESOLVED, that this honorable body of the 39th Legislative District hereby recognize and commend Chief Scott Duncan, Assistant Chief Jason Smith, Firefighter Brandon Kallner, Captain Nicholas Minute and Lieutenant Ethan Sharp for their unselfish dedication to the people of the City of Buffalo and the Town of Hamburg during the snowstorm of 2014. This entry was posted in News, Why Volunteer and tagged 2014 Buffalo Snowstorm, Albany County, Albany County Hilltown, Albany County Legislator, Berne, Deborah Busch, East Berne, East Berne Chief Scott Duncan, Erie County, Town of Hamburg NY, Westerlo, Western New York State on December 16, 2014 by westerlofiredepartment. Members of Berne, East Berne, Knox and Westerlo Volunteer Fire Companies presented fire safety to the elementary school students at Berne, Knox, Westerlo School. Firetruck tours and and equipment presentations were followed by classroom instruction about home fire safety, the use of smoke detectors, where they need to be installed, and planning on safe egress from the home in the event of an emergency. Volunteer firefighters not only plan for emergencies, they do their utmost to prevent them from happening by interacting with the community, teaching the community members what they can do to prevent home fires and whet to do in the event of a fire. This entry was posted in News on October 16, 2014 by westerlofiredepartment. Westerlo VFC Treasurer Lisa Joslin discusses the fire company’s latest community breakfast, how spouses can get involved in the volunteer fire service, and an online support system for wives of volunteer firefighters. 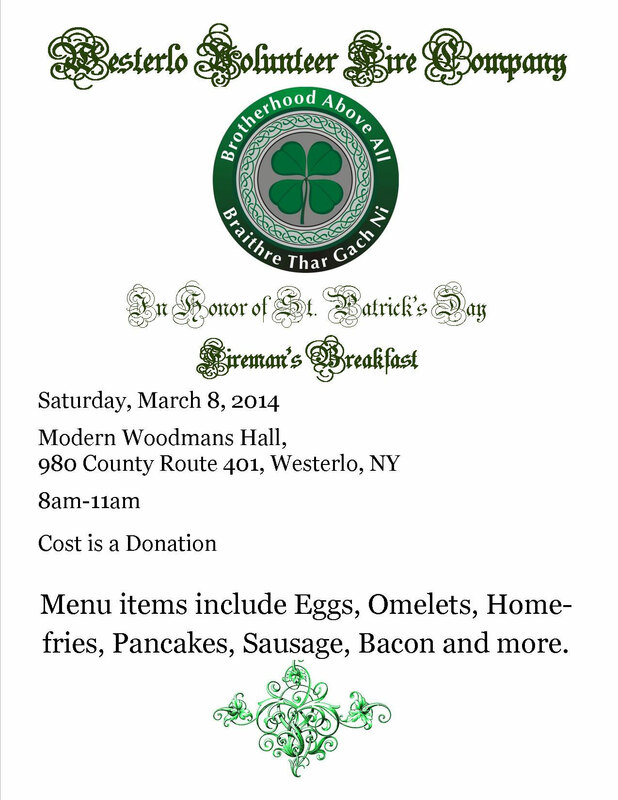 Westerlo Fire Breakfast Saturday, March 8, 2014 from 8 a.m. to 11 a.m. at the Modern Woodman’s Hall, 980 County Route 401, Westerlo. The menu items include omelets, eggs, pancakes, hash browns, fruit, cereal, and more. Items are cooked to order and the cost is a donation. Why Did You Become a Volunteer Firefighter? Bethi Smith started her career in the fire service by joining the ladies auxilliary. She then decided to switch over to exterior firefighter. Learn. Drill. Do. — Join Us. This entry was posted in Uncategorized on March 1, 2014 by westerlofiredepartment.